The luxury villas at Villas du Club Royal are all situated on or around the Moilets-et-Maâ golf course (3 km). They all have well-maintained interiors, which can differ per type. Each villa has a private swimming pool, a garden and a partly covered patio. Most villas have a washing machine and dryer and some have an open fire in the living room. The holiday homes are either detached or attached. Villa FR-40660-47 is suitable for 4 - 6 people and has sliding doors to the patio. 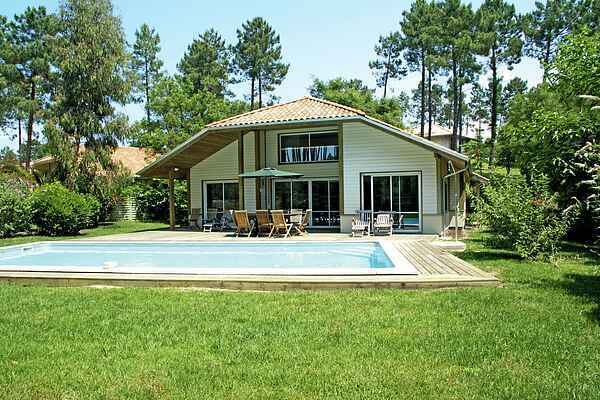 The slightly larger villa, FR-40660-48 (6-8 people), has three bedrooms; in some the third bedroom is on a mezzanine. Most of the villas of this type have a third bathroom (with shower and toilet). This is also the case with the villa FR-40660-50 (8-10 people). This accommodation had an extra bedroom, which is sometimes furnished with a bunk bed. A few of the bedrooms in this villa are upstairs. That is also the case with the larger villa, the FR-40660-49 (10-12 people). This has five bedrooms, of which one is usually on mezzanine level. Two bedrooms usually have bunk beds.